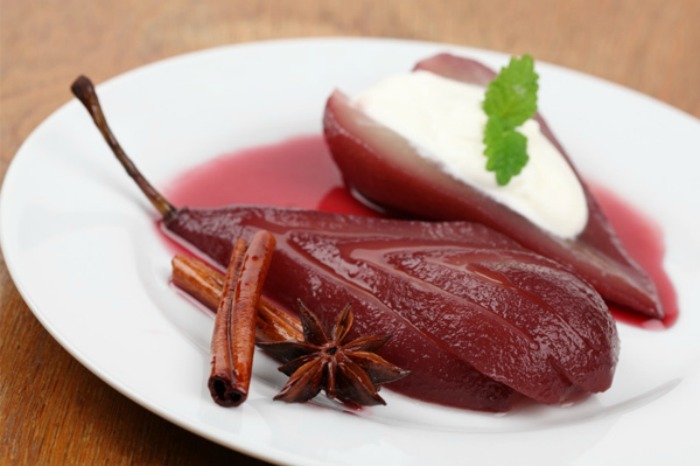 Pears with red wine is a very delicate dessert with an intense flavor, suitable as a dessert in colder periods. In a saucepan, combine wine, sugar, zest, cinnamon stick. Bring to a boil, reduce heat and simmer for 5 minutes. While liquid is simmering, peel pears, leaving stem intact and being careful not to blemish the flesh of the pears. Slice 1/2-inch off the bottom of the pears to create a flat bottom. Gently place pears in poaching liquid, cover, and simmer for 15 to 20 minutes, turning every 5 minutes to ensure even color, until pears are cooked but still firm. Remove saucepan from flame, uncover and cool with pears upright in pan. Once cool, cover and chill in refrigerator at least 3 hours. Gently remove pears from liquid and allow to come to room temperature. Meanwhile, reduce liquid by about half over a medium-high flame for 15 minutes, until liquid is thicker and slightly syrupy. Remove from flame and let liquid come to room temperature. Drizzle each pear with 2 tablespoons syrup and serve.